Light breezes kept the mosquitoes at bay around the campfire. Stars sparkling in the vast black sky overhead gave a peaceful feel. Occasionally you’d hear a fish splash in their leap from the Klamath River nearby. 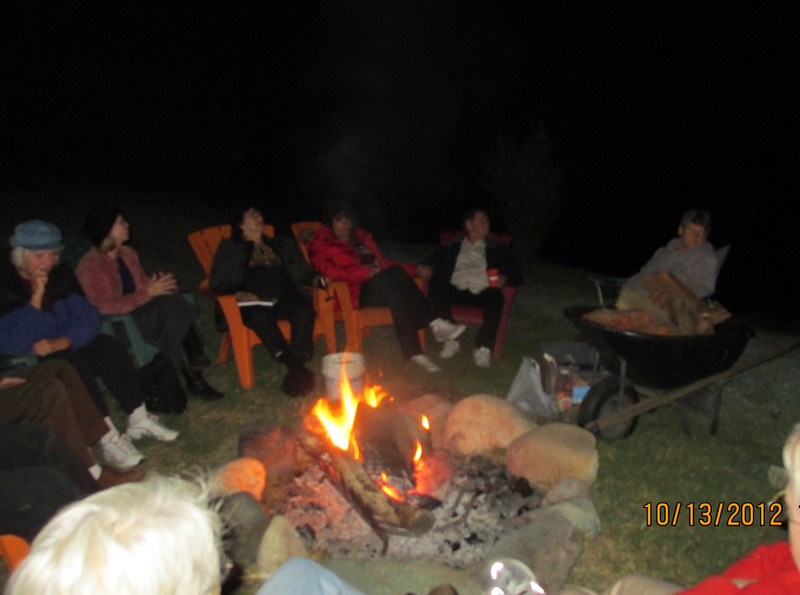 Sitting around a cheery campfire with friendly camaraderie was the perfect end of a very busy day. We were content from the 50’s style Sunday chicken dinner that Bonnie had made and was served by smiling high school girls. 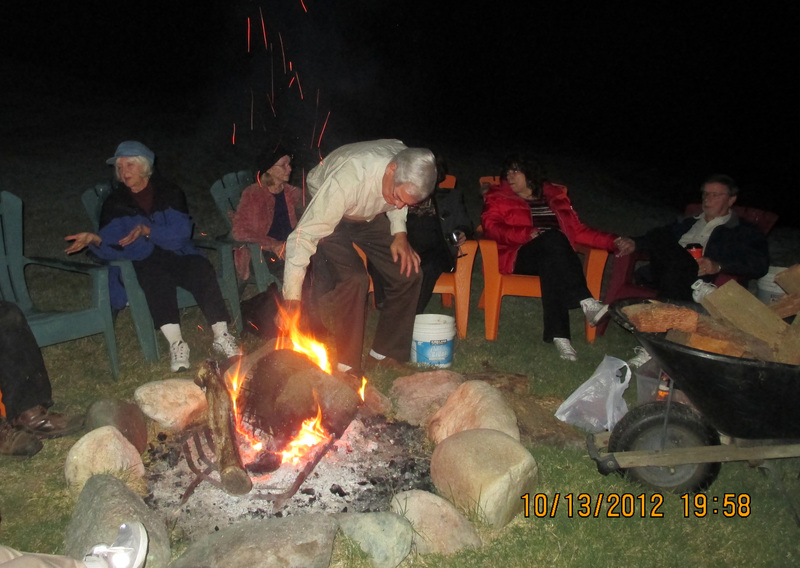 Previous year Gloria had made delicious so ‘mores, but we’d enjoyed dinner and all the homemade pies! Pete had brought his guitar and sang a couple of songs, one about the silver-hair aging, and one he’d just written about new young life. How fast it goes from one to the other. A couple from the resort joined the circle and asked what brought us here. Liz explained we were celebrating the author, Stella Patterson, who wrote Dear Mad’m. Liz and Pete Lismer, grandnephew of Stella, had written Dear Mad’m Who Was She? answering many questions about Stella’s life. .. They shared how Stella’s relatives wanted her to move back to San Francisco to “take care of her” in her declining years. Her independent streak and having been told she had “young legs” recently, led to her plan. For one year she wanted to live on her mining claim on the Klamath River! That it was for “business reasons,” gave her the excuse she needed! She’d try it for a year. Dear Mad’m was the book she wrote about living in a rustic cabin, the friends she met, a mule named Pete, goats invasion, learning mining and clean-up, storms, wildlife, without indoor plumbing, woodstove, and other challenges, with only her faithful dog, Vickie. Even with all the answers to questions about Stella’a life, more questions pup up. On that night around the campfire, as we so often wished that we could ask her questions and get to know her better. If only she had written more! Have you ever written down the stories of your life? You have wonderful experiences, probably hardship and trials mixed in too, but they’ve made you who you are and you’ve learned from them. Write them down! It might end up being something you’d just want to share with your family and friends, but Stella W. Patterson’s one year story turned into a best seller and 70 years later, people are still reading and enjoying her adventures. Adventures which are like those you have in your own life each day and could write about as well.